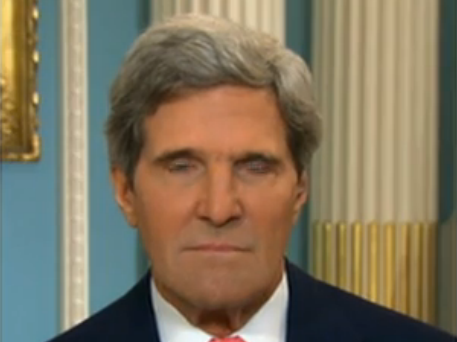 United States Secretary of State John Kerry made the rounds on the Sunday morning talk shows this morning. The War in Syria, the Syrian government's recent use of poisonous gas on its own people and how the U.S. will respond to this act is of course of great urgency. President Obama announced yesterday that he will seek congressional approval for military action. What follows is an analysis of one particular of the Secretary's nonverbal signals. Beginning at 0:07 in the video above, Major Garrett asks John Kerry, "Now Mr. Secretary, I know you believe the President's decision to seek congressional authorization is courageous, but isn't it bowing to a political reality that had been communicated to the President later ... late this week, that there would be significant congressional backlash if he didn't give Congress in a role - and that backlash, in part, reflected the inability of the administration to make its case this past week?" This image captured at 0:23 is shows the beginning milliseconds of a microexpression of disgust. This emotion is hidden within the disguise of a nose sniff and thus it's almost never recognized as such. This nonverbal signal occurs just after Mr. Garrett says the word, "... backlash ..." for the second time (during 0:23 and underlined above). Note the tightening (muscle contraction) of the area above his upper lip and below his nose (aka the "mustache area"). 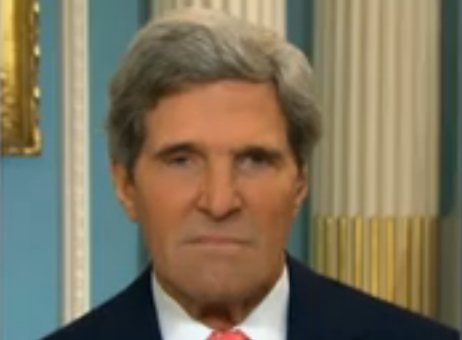 Both of Secretary Kerry's nostrils are also flared (dilated). This photo is captured a fraction of a second after the one shown above. There is significantly increased nasal flaring as well as more tension in the mustache area. 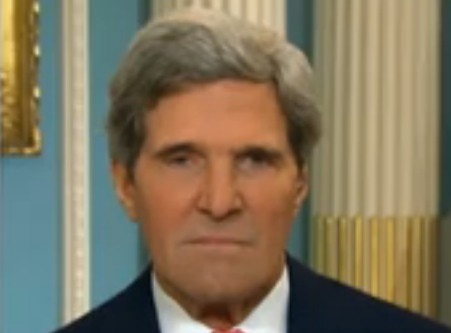 The corners of Kerry's mouth are slightly depressed in this moment as is his lower lip (both consistent with disgust). His thinned upper lip also is strongly suggestive of the presence of a component of anger. It is a very common phenomenon that in the split second just prior to, during or immediately after a display of disgust, contempt or anger - that the eyelids shut for an extended or prolonged blink. An increased rate of blinking is a different but related body language tell. These subtle but significant nonverbals act as body language amplifiers. Here they amplify disgust and to a lesser degree anger. It is also important to note that the Secretary's right upper eyelid is "droopy" (see first two images and video). This condition is known as "ptosis" and is most probably age-related. This change is separate and distinct form the other eyelid dynamics described above. It is advisable, particularly because of his importance on the World stage, that Secretary Kerry has this condition surgically corrected - as it will influence the way others interpret the diplomat's emotions. Mr. Kerry is clearly disgusted in this moment and the timing of his expression strongly implies that the source of his disgust is the "backlash" directed at President Obama of which Mr. Garrett speaks (Although it is very possible that his disgust may directed towards the events in Syria, the news anchor himself or the manner in which he asked the question).